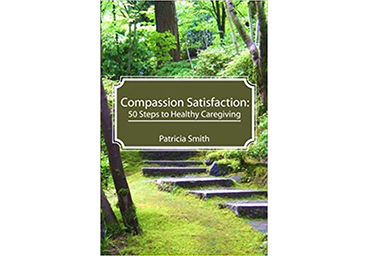 Patricia Smith, founder of the Compassion Fatigue Awareness Project©, has published her newest book Compassion Satisfaction: 50 Steps To Healthy Caregiving! In it, she guides readers through the path to authentic, sustainable compassion satisfaction. Patricia Smith, founder of the Compassion Fatigue Awareness Project©, recently published To Weep for a Stranger: Compassion Fatigue in Caregiving. Along with in-depth explanations of compassion fatigue and its symptoms and causes, the paperback features comprehensive chapters on topics such as The Burdens of the Chosen, When Caring Too Much Hurts, The Decision to Heal, and Standards of Self-Care. you through the basics of creating a workshop and training others on how to identify symptoms and root causes of compassion fatigue. Once understood, trainers and their participants can begin to travel the path to authentic, sustainable self-care. The two guides are easily adaptable to all caregiving professions. With this presentation and a copy of the Presenters Guide, you have the tools necessary to create a comprehensive compassion fatigue workshop. created as a training aid to accompany the Presenter's edition of 'Healthy Caregiving: A Guide to Recognizing and Managing Compassion Fatigue'. The slides mirror the main themes in the workbook for a seamless integration of materials when giving a workshop. Combine them both with the Student Guide and you have the perfect setting for starting down the path to compassion satisfaction at your organization or in your community. James Madison had his Bill of Rights in 1789. Finally, over 200 years later, caregivers across America have theirs! They may not be law, but they will certainly help you with your continuing journey towards resiliency and compassion satisfaction. DOWNLOAD THE PDF POSTER HERE! Here at Healthy Caregiving, we believe you can take control of your own well-being and create steps towards healing in your own life. The following are 'Eight Laws' to help you create a healthier workplace for yourself, provide healthier care for others, promote healthier change in your life, and practice better self-care. Print them out and put them up where others can see. Make sure people are aware you are dedicated to positive change in your life by following these simple rules. DOWNLOAD THE PDF POSTERS HERE! Healthy Caregiving, LLC. is a California-based organization dedicated to the well-being of caregivers worldwide.